Shirts With Random Triangles: Austin Hardin Is An Ex-Florida Gators Kicker. Austin Hardin. Image via The Palm Beach Post. 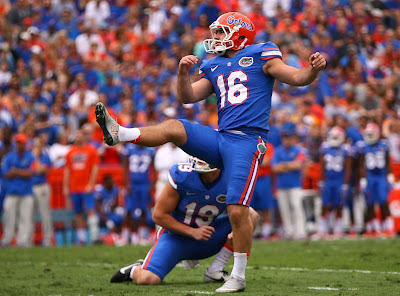 Austin Hardin is an ex-Gator. The kicker has announced his intention to transfer from Florida after a disappointing 2015 season. Hardin was 5 of 14 in kicking attempts made in 2015. He missed the 2016 Citrus Bowl due to an ankle injury. The move coincides with the signing by Florida of freshman kicker Eddie Pineiro, whose 77 yard kick vent viral on Twitter. There is no work on where Hardin, who will eligible for the 2016 season via graduate transfer, might wind up next season. He is scheduled for graduation from Florida this spring.